If the place where wine grapes are grown did not make noticeable difference in how the wine tastes a California Mourvedre and a Spanish Monastrell – other factors being equal - would taste the same. A French Chablis would be like any California Chardonnay and a New Zealand Sauvignon Blanc the same as a Californian or a French Pouilly Fume. We know that is not so, but how much of a difference does even a small area within the same country make? The answer is a lot. This is evident in Burgundy France but to really appreciate the difference in terroir, or what a gardener might call a micro-climate, is difficult. To have a valid comparison after all, the grape, vintage and vintner need to be the same. That’s not easy to experience. Fortunately, the Vietti winery in Italy serves as a good instructor with their Barbera wines, and you can play this learning game at home. Barbera is the 3rd most planted grape in Italy. It’s known as the people’s grape, producing a wine for daily consumption. Barberas are known for their deep color, low tannins and high acid. Both the D’Alba and the D’Asti are from the Lange region in Piedmont, Italy. So is there really a difference between the two wines? Knowing the answer in advance is just not as much fun as tasting and experiencing the answer. So I invited another wine lover to appreciate the difference with me. I opened a 2006 vintage which is drinkable through this year. Asti is just a little Northwest of Alba. 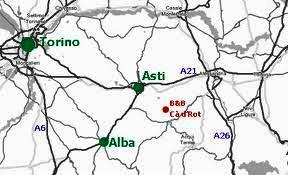 So, in some cases, grapes grown in the Southwest of Asti will be growing very close to the Northeast border of Alba. Nonetheless, Alba is considered the better of the two areas and produces the more price commanding Nebbiolo grapes in addition to Barbera. Am I seeing double? No. The bottle on the right is D'Alba. If you do what I recommend, and that is to buy a bottle of both Vietti’s Barbera D’Asti and Barbera D’Alba (make sure the year is the same), I think you will find the Alba to be fleshier. Both wines are jammy, with black cherry and spice, but you will find the D’Asti more acidic and less rounded and balanced than the D’Alba. Either wine will go well with beef, sausage, pizza or pasta with tomato sauce and Parmesan cheese. And the experiment should be fun because knowing is seldom as much fun as experiencing. In the process, you will better appreciate the difference of terroir. Vietti’s Italian Barbera wines are widely available, often both DOCs within the same retail store. Have fun and smile!